Net Wt. 2.2 oz. 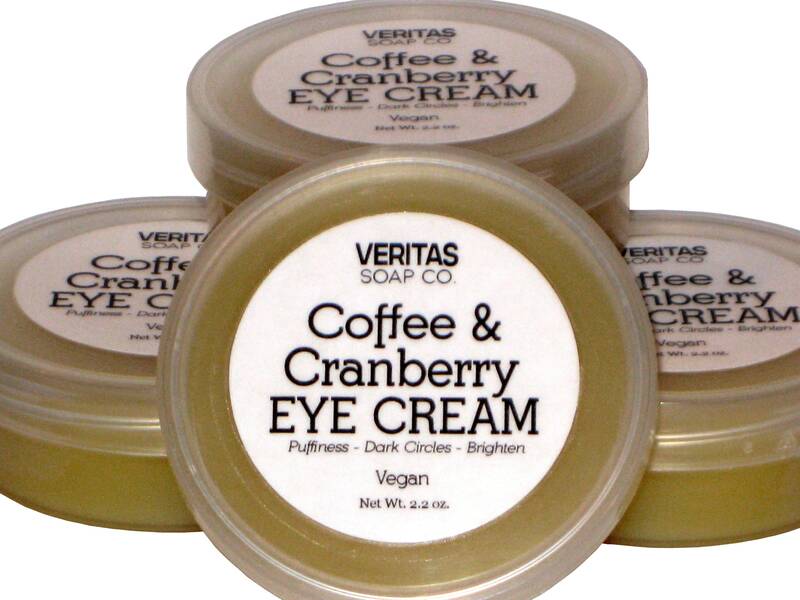 - COFFEE & CRANBERRY EYE CREAM - FREE SHIPPING! 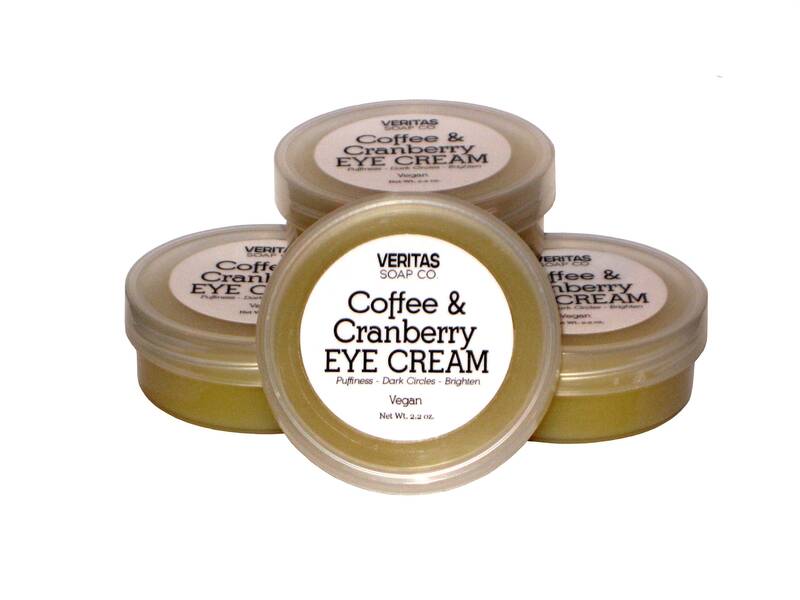 Give those beautiful peepers a boost of caffeine with our NEW Coffee & Cranberry Eye Cream! 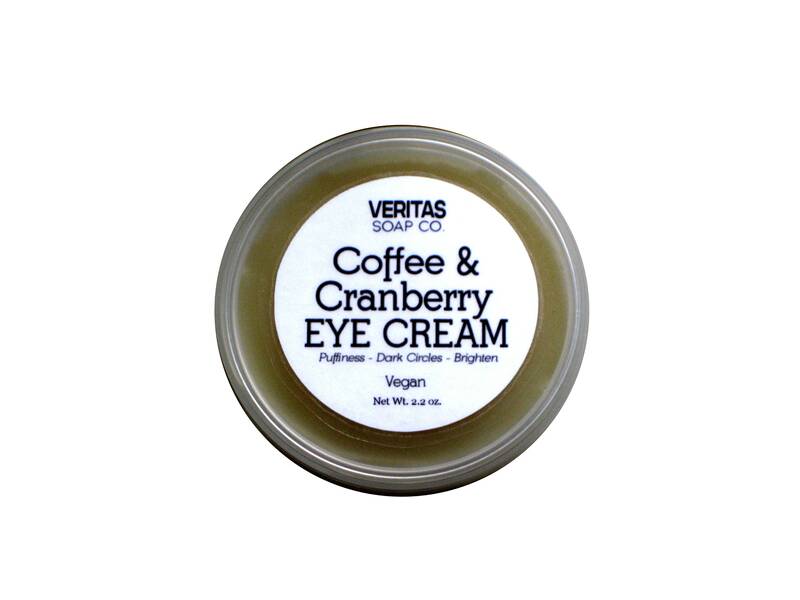 This luxurious Eye Treatment smells delicately like Coffee with a hint of Lavender, perfect for the sensitive areas of your face. Take a look at these amazing ingredients below! Coffee Butter - Made from real coffee seed oil and helps to increase circulation while decreasing puffiness and dark circles. It is rich in the polyphenol Chlorogenic Acid which is a powerful anti-oxidant that provides superb free radical scavenging properties. The phytosterol (plant sterol) content of Coffee Bean Butter also gives it anti-inflammatory action and has been shown in clinical studies to ease skin redness and swelling. Cranberry Butter - The Cranberry Fruit has one of the highest ORAC (Oxygen Radical Absorbance Capacity) which means it is VERY high in anti-oxidant properties! This amazing butter has an effect on wrinkles and fine lines, giving you a bright and clear look to your skin. It has also been show to help reduce dark patches and redness. Andiroba Oil - Harvested from the seeds of the South American Andiroba Tree, Andiroba is a rich and difficult oil to extract; taking approximately a month from start to completion. This unique combination of essential fatty acids and anti-inflammatory compounds has been shown to help calm puffiness and plump skin at the same time. Andiroba Oil is very high in limonoids and triterpenes which are very powerful anti-inflammatories, which is why it is often found in formulations for muscular aches and pains and products intended to reduce swelling. Tamanu Oil - A nut oil from the South Pacific that is extracted from the nut kernels of the Tamanu Tree after they have been left to cure for over a 6-8 week period. The Tamanu Nut Tree is a member of the Mangosteen family and is said to have a natural SPF of about 18-22 due to it's high levels of Sc Glucan, an enzyme which is thought to help reverse the aging process. Shown i clinical studies, it has the amazing ability to renew skin tissue, reducing the appearance of not only acne scars and stretch marks, but it also helps to reduce the appearance of fine lines & wrinkles. Rose Hip Oil - Is pressed from the fruit and seeds of the rose plant. Not only do the fatty acids and Vitamin A in Rosehip Oil moisturize the skin, but they also help to promote skin regeneration, and can improve the skin's flexibility and permeability. This means that rosehip oil products can improve skin texture helping it to look more youthful and bright. 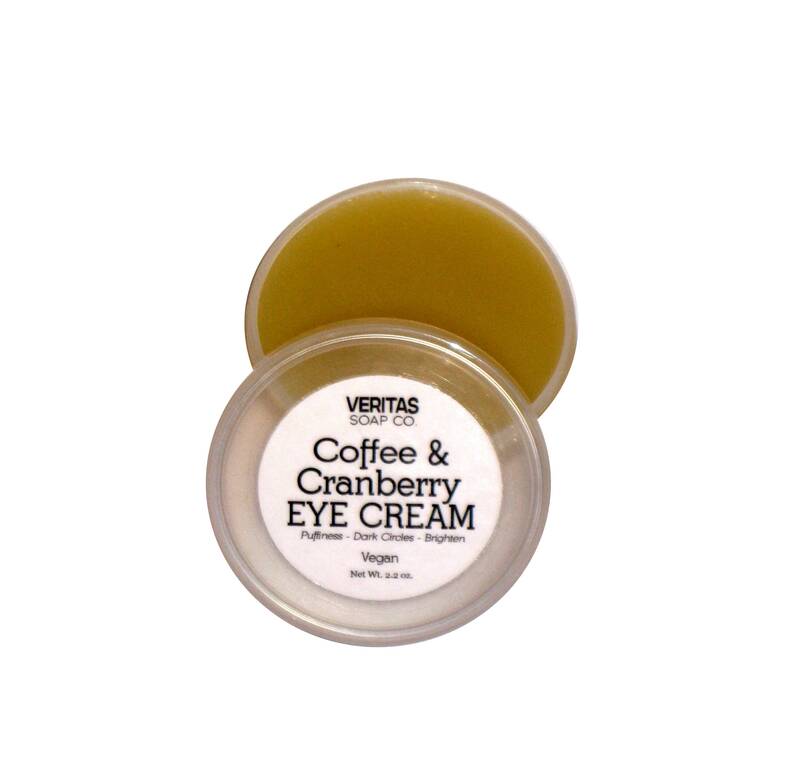 HOW TO USE: Around eye area day or night; press into skin - a little goes a VERY long way! You can also use this wonderfully scented cream on your entire face to help brighten up uneven & dull skin. Make sure to exfoliate the treated area every other day with a wet soft cotton cloth. For eye area, exfoliate inwards being sure not to tug or "pull" on the eye area. INGREDIENTS: Organic Avocado Oil, Organic Unrefined Coconut Oil, Coffee Butter, Cranberry Butter, Organic Rose Hip Oil, Organic Tamanu Nut Oil, Shea Butter, Andiroba Oil, Aloe Vera Oil, Candelilla Wax & Pure Lavender Essential Oil.